Today, 27 April 2018, South Africans celebrate Freedom Day, which marks the start of our hard-won transition from Apartheid to Democracy and Freedom. However, after twenty-four years of freedom South Africans still struggle to correct and change the inequalities of Apartheid. Racism, poverty, unemployment, unequal land distribution, as well as a lack of housing and quality education, are but a few of the social challenges that perpetuate the cycle. As a nation in constant transition, we understand that effective change requires time and dedication. We are a nation with unlimited potential and as such we acknowledge that required changes are NOT happening fast enough. For this reason, South African citizens have increasingly been venting their frustrations and have been taking to the streets protesting, picketing, and marching to voice their dissatisfaction with local and national government’s lack of effective service delivery. The MJC wants to remind ALL South African citizens that in our quest to have our basic needs and rights afforded to us, as guaranteed in the RSA constitution, we cannot resort to violence, looting, and the destruction of property and our precious resources. At the same time, we strongly urge the RSA government both locally and nationally to urgently address the disparities that exist in our society and to remove all red-tape that may be hampering the process. We further urge the government to address their needs urgently and adequately and fulfil the rights of our beloved citizens. On a positive note, today is a day in which we celebrate our constitution that enshrines the right to freedom of religion as stipulated in Chapter 2 of the constitution. We need to remember that with this freedom comes immense responsibility. We urge all citizens of our country and especially our Muslim community to become active citizens and participants in all spheres of life to develop, grow, and transform our country into one that will leave a proud and positive legacy for generations of South Africans to come. On this day we should also NOT forget the iconic words of our anti-Apartheid Revolutionary and Former President, Nelson Mandela when he said: “South Africa will NOT be free until Palestine is free”. This year marks the 70th anniversary of the founding of the Zionist State of Israel and the direct violation of International law. Palestinians, including Arabs, Christians, and even certain ethnic Jews are being forced out of Palestine and even massacred for protecting their freedom to live in their country and place of birth. Yet, these gross violations are met with silence by the International community. In South Africa, we will continue to support the Palestinian issue and champion their just cause for freedom, liberation, self-determination, as well as their right to return to their land. We cannot ignore the grossly inhumane treatment (and massacres) of people in Palestine, Yemen, Syria, Rohingya, Sudan, Somalia, and many other countries. We beseech Allāh Almighty to ease their burdens and grant them justice, peace, and freedom, Āmīn. 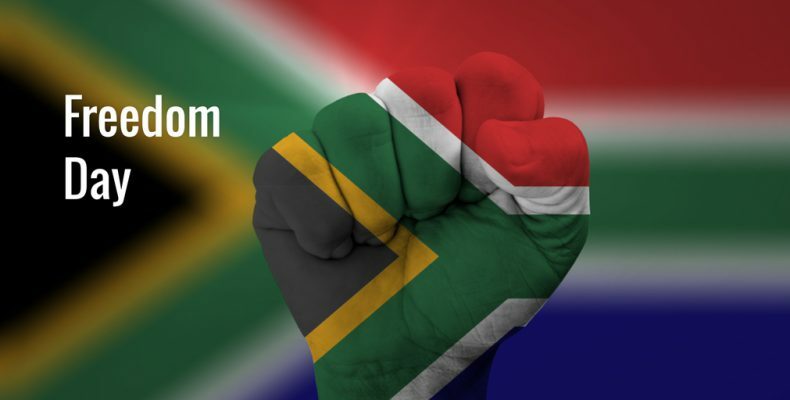 We remind ALL Muslims and fellow South Africans, that as we celebrate Freedom Day today, we should continue to earnestly strive to gain ultimate freedom and emancipation from Hell-fire, Āmīn.